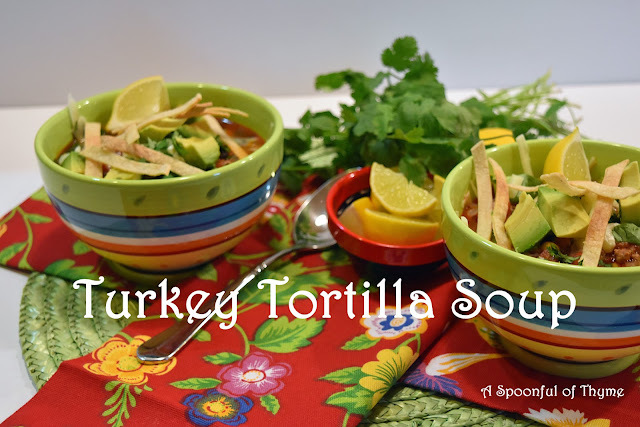 Turkey Tortilla Soup...what a tasty and healthy soup! This soup was so delicious, that there was no question about whether or not leftovers should be served. Actually, seeing the bottom of the pan was disappointing! Living in California, Mexican cuisine is just a regular part of our rotation. I love the flavors, the spices, the spiciness...just about everything. Now, can I make really authentic dishes? Well, sometimes, it all depends. Is this soup authentic? Probably not. For authenticity I do refer to Rick Bayless, my favorite source for Mexican cooking. Did I refer to Rick for this recipe, no. But, I did use his technique for preparing the tortilla strips. Today is Soup Swapper Saturday and our theme is Mexican Soups! I am really looking forward to each participant's post today...I so love Mexican cuisine. Our hostess today is Karen at Karen's Kitchen Stories. Thank you, Karen, for selecting such a great theme!! Heat the olive oil in a large Dutch oven. Add the onion and peppers. Cook, over medium high heat, stirring occasionally, until they are soft and translucent, about 7 minutes. Add the jalapeño and garlic. Cook 1 minute. Add the spices: chili powder, cumin, cocoa, oregano, paprika, cayenne, red pepper, 1/2 teaspoon salt, and a few twists of black pepper. Stir. Add the turkey and cook, breaking up the turkey with a wooden spoon, until it is browned and cooked through. About 8-9 minutes. Stir in the tomatoes and the chicken broth. Bring the mixture to a boil. Reduce the heat and simmer for 20-25 minutes. Prepare the tortilla stips while the soup is simmering. Cut the tortillas into strips. Place the strips on a cookie sheet in a single layer. Mist both sides lightly with vegetable oil. Bake, stirring them around once or twice, until they are crisp and lightly golden, 10-15 minutes. When the soup is finished simmering, stir in the beans and the corn. Allow the mixture to simmer until it reaches serving temperature. Ladle into bowls and serve with the tortilla strips, a squeeze of lime and additional toppings as desired. Note: The soup keeps well and may be prepared the day before. Add all of the garnishes just before serving. I'll be making this soup again soon. It was hearty, healthy and flavorful! What an amazing list of ingredients! Even cocoa powder! This soup sounds delicious, and your photos are gorgeous! That was really on my mind at first, and I almost went with a tortilla soup version.. glad you made it! plus, with ground turkey - it is a complete, satisfying meal! I had no idea tortilla strips were that easy to make- love this and have to try doing that soon! Your soup sounds fabulous. I'm sure Rick would approve. This is a great recipe to share with First Monday Favorites. I cannot get my eyes off of the beautiful colorful bowls out there. Beautiful presentation and this soup looks delicious too. This sounds wonderful, we're big Mexican food nuts here. 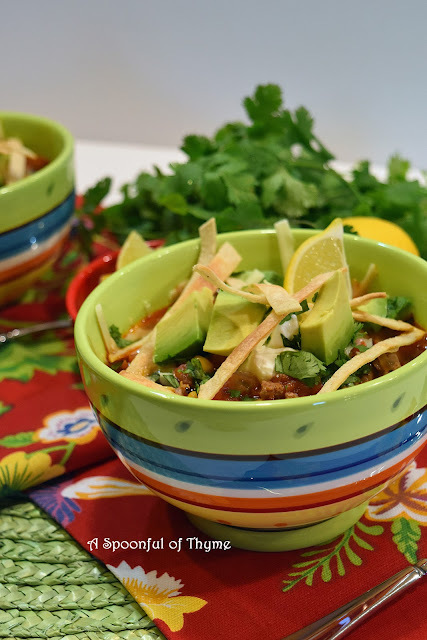 How great that you used turkey to make this Mexican soup even healthier! Looks and sounds wonderful! Thanks so much for linking to First Monday Favorites. I'd already bookmarked it anyway. I think I can understand why this was your favorite recipe for March...it sounds delightful! It sounds like a gorgeous soup and definitely one that I'd enjoy too!